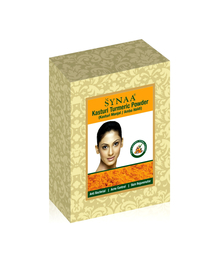 Synaa Multani Mitti Face Pack (Fullers Earth) revives and restores natural beauty of the skin. It is effective clay for improving the facial complexion. It makes and excellent cleansing mask, possesses highly absorbent qualities. Removes deep seated impurities. It helps in improving the blood circulation while absorbing the dead cells on skin surface. It absorbs the excess oil providing healthy and supple skin. 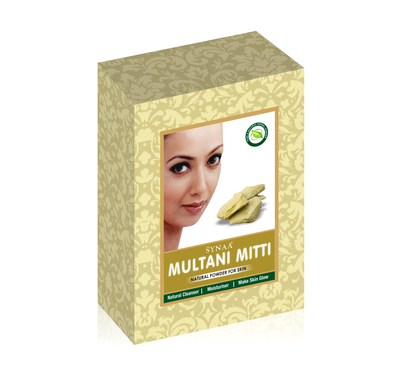 Multani Mitti - Synaa Herbal Multani mitti is said to make your skin radiant and attractive by getting rid of blemishes and acne scars. On the other hand, it also hydrates the skin, clears up black heads and whiteheads, and flushes out toxins. Deep cleansing with Multani Mitti helps to remove impurities and dead skin cells, allowing the skin to breathe and absorb moisturizing cream more easily into the skin, leaving you feeling glowing and refreshed! Appearance: The color of Multani Mitti Clay may be from cream to more of a yellow color. Application: Mixed with water, it can be used in place of soap to wash oily complexions. Made into a paste with rosewater and left on to dry, it makes an oil-absorbing and detoxifying mask suitable for oily and normal complexions. It is the basis of a traditional home remedy for acne which includes the use of rosewater and lemon juice. It can also be used as a baby powder (pat on, do not shake), in dusting powders, and as a dry shampoo. Active Ingredients: Multani Mitti (literally, Multan's Sand) is a type of non-plastic Kaolin, and is high in minerals, especially aluminum magnesium silicate. Synaa Multani Mitti Face Pack (Fullers Earth) revives and restores natural beauty of the skin. It is effective clay for improving the facial complexion. It makes and excellent cleansing mask, possesses highly absorbent qualities. Removes deep seated impurities. It helps in improving the blood circulation while absorbing the dead cells on skin surface. It absorbs the excess oil providing healthy and supple skin.Multani Mitti - Synaa Herbal Multani mitti is said to make your skin radiant and attractive by getting rid of blemishes and acne scars. On the other hand, it also hydrates the skin, clears up black heads and whiteheads, and flushes out toxins. Deep cleansing with Multani Mitti helps to remove impurities and dead skin cells, allowing the skin to breathe and absorb moisturizing cream more easily into the skin, leaving you feeling glowing and refreshed! Appearance: The color of Multani Mitti Clay may be from cream to more of a yellow color. Application: Mixed with water, it can be used in place of soap to wash oily complexions. Made into a paste with rosewater and left on to dry, it makes an oil-absorbing and detoxifying mask suitable for oily and normal complexions. It is the basis of a traditional home remedy for acne which includes the use of rosewater and lemon juice. It can also be used as a baby powder (pat on, do not shake), in dusting powders, and as a dry shampoo. Active Ingredients: Multani Mitti (literally, Multan's Sand) is a type of non-plastic Kaolin, and is high in minerals, especially aluminum magnesium silicate.